Since my early teens I have been a fan of Michael Crichton – most of my adult reading life. I have always looked forward to his novels, and was deeply saddened to hear of his death in 2008. Yet since then there have been two new Crichton novels published – Pirate Latitudes, discovered completed on his computer after his death, and the recent Micro, which was around a third completed and has been finished by Richard Preston, based on Crichton’s outline and notes. Prior to his death, Crichton described Micro as “an adventure story like Jurassic Park”. Set in Hawaii, it follows six graduate students as they visit a company called Nanogen which is promising them jobs using advanced technology and research methods. The technology is indeed there – but of course things go a bit wrong. An adventure story it certainly is. The students are placed in danger in a far from normal scenario, and must use all their wits and knowledge to get out alive. Micro is fast-paced, full of page-turning action. Yet perhaps due to it not being 100% Crichton, it doesn’t quite match up to previous works in terms of complexity. The science is explained less than you might expect, and in fact there are not many scientific sections – the narrative focuses on the action, the result of the science rather than the reasons the action is taking place. Additionally, the story of Micro felt much more straightforward than other novels by Crichton. It seemed much more linear – characters go somewhere, get in danger, fight for lives, big ending. Of course that simplistic model could in fact be applied to, say, Jurassic Park, but the difference with Jurassic Park is that there are characters with several stories being told separately. There are also more aspects to the story, as they escape from dinosaurs (a lot), solve the mystery and then a long build up to the escape from the island. Micro doesn’t have the same depth to it. Perhaps my biggest issue with Micro actually lies with the story itself – and this is presumably something which can be fully attributed to Crichton, even if the execution was largely done by Richard Preston. 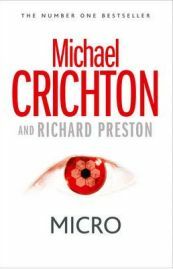 Crichton is usually very original and cutting edge in his stories, yet the main aspect of Micro is reminiscent of an early 1990s popular family film. I won’t say which as that would be a whopping spoiler, but suffice to say that, in essence, Micro is a grown up, scarier and more scientific version of a Disney family film. This realisation didn’t spoil my enjoyment of the novel, but it did make me feel somewhat disappointed. However, before you start thinking I have nothing but criticism for my favourite author, let me say that I thoroughly enjoyed Micro. It is exciting and very enjoyable – it just isn’t as good as Crichton’s other novels. There are many possible reasons for this – it is not written 100% by Crichton, perhaps his notes and outline weren’t complete and therefore this isn’t the full story he planned, or there is of course the option that maybe this just wasn’t going to turn out to be one of his best. Micro is certainly a good read, and well worth the time. But if I had to rank his novels in order of preference, sadly this last farewell from a wonderful author would not be up there with the many great novels he produced.